Most little boys play war, but you can’t get your hands on the really cool toys until you’re an adult. 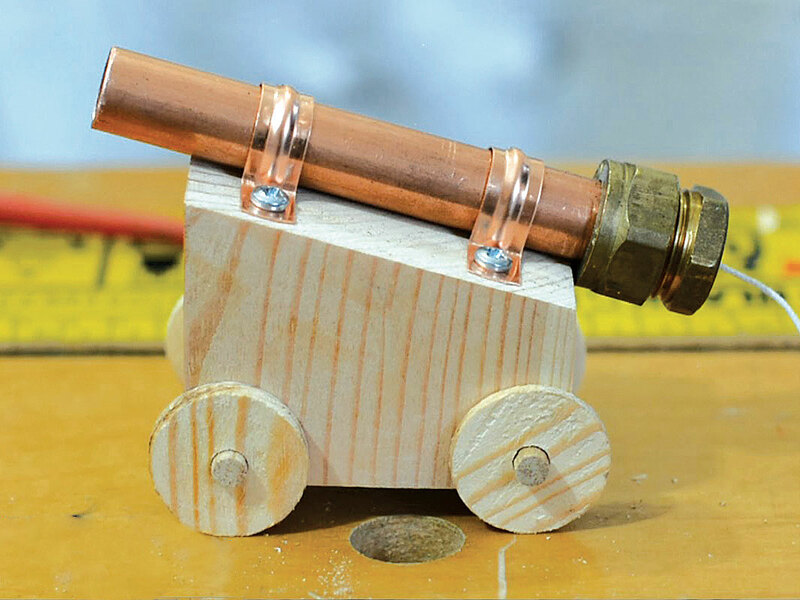 So I wanted to bridge that gap a little by making a toy cannon. This was a quick model made with very little planning, but by taking your time on the details I imagine you could easily make a better version. WARNING: Take all necessary precautions and wear safety equipment during this build. Be careful when handling party poppers, as they do contain explosives, and never fire at anyone. Step #1: Cut the cart. Make the cart the cannon is going to sit on. I used wood reclaimed from this device I made many, many years ago, to screen print T-shirts. But now I use an outside company to make our T-shirts, so it’s no longer required. Cut the wood into a 77mm long × 43mm wide block, then chop the top at a 15 degree angle. Step #2: Cut the wheels. 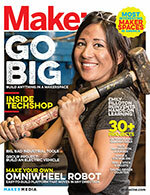 For the wheels, drill 4 cores from 5mm wood using the hole saw, then drill 7mm holes in the center of each. Now give everything a sanding before you put it together. Take your time here and make sure you get all the wheels the same diameter and thickness. You can also work out any splinters you have and even any cuts that are slightly off. Drill two 7mm holes through the width of the wood block, in the bottom front and the bottom rear, to accept axles. Drill a 2mm hole through the compression cap. Step #5: Assemble the cannon. Insert the axle dowels and use a blob of wood glue to attach each wheel permanently. Remove any burred edges on the cannon barrel, inside and out. Attach the cannon barrel to the top of the block using the saddle clips and screws, leaving a slight overhang on both sides of the cart. Disassemble 5 party poppers and tie together the 5 mini explosives. Feed one string through the hole in the compression cap. Step #7: Tighten the cap. Tighten on the compression cap so that the “olive” ring binds, then loosen it slightly so that later you can remove and retighten it by hand. Step #8: Load the ammo. Using the third dowel, ram a cotton ball or two down the barrel of the cannon, so they sit over the explosives. Lastly, add the ammo (I used a lid from a soy sauce bottle) and you’re ready! Pull the string to fire. You can easily make your own adjustments to this cannon design to make all different types and styles. But if you do make a toy cannon, don’t forget to share a picture of it with us. Use a miter saw or a chop saw to easily cut the angle you want. Make sure your saw blade has a high number of teeth (depends on what saw your using to what is applicable to you) to give a cleaner cut. If you can get access to a bench drill press, then use that to cut out the wheels and drill the cart body for the wheel axles. If your wheels are a bit wonky then you may have not drilled straight or your dowel was not straight. Don’t worry, you could start again or you could sand down the wheels until the cart is level. If your cannon isn’t firing very far or at all, then you’ve either jammed too much cotton wadding in or you’re not using enough party poppers. Make sure your projectile is light and free to move up and down the pipe too. Some party poppers use a lot of paper around their popper, which can prevent them from setting each other off when you attach them together. To overcome this I removed some of the outer paper and it worked fine. Paul Rawlinson makes random projects and shares the results on his site, go-repairs.blogspot.co.uk and YouTube channel, youtube.com/user/gorepairs/.